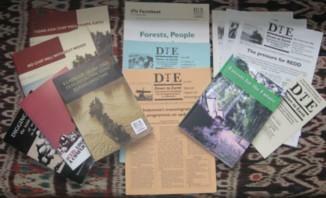 DTE's quarterly newsletter provides information on ecological justice in Indonesia. To get on the mailing list for e-updates with links to the latest articles or PDF file of the full newsletter, click in the green box on the homepage. The Bahasa Indonesia list offers links to selected articles from each newsletter issue. To get on our mailing list for hard copies (£10 a year, English newsletter only) send a request to dte@gn.apc.org. More violence near the Freeport-Rio Tinto copper and gold mine in West Papua resulted in three deaths - two Freeport employees and a police officer - in July. Police arrested seven people: two of them worked at the company's Grasberg mine. More shots were fired at a bus carrying the mine's employees in August, with one incident leaving five people injured.